It's been eighteen months since the Raxter School for Girls was put under quarantine. Since the Tox hit and pulled Hetty's life out from under her. It started slow. First the teachers died one by one. Then it began to infect the students, turning their bodies strange and foreign. Now, cut off from the rest of the world and left to fend for themselves on their island home, the girls don't dare wander outside the school's fence, where the Tox has made the woods wild and dangerous. They wait for the cure they were promised as the Tox seeps into everything. But when Byatt goes missing, Hetty will do anything to find her, even if it means breaking quarantine and braving the horrors that lie beyond the fence. And when she does, Hetty learns that there's more to their story, to their life at Raxter, than she could have ever thought true. I want to start off my teaser review thanking Chloe @ The Elven Warrior for being the best and letting me borrow her ARC of Wilder Girls when she heard how much I wanted to read it. This book was a thrill ride from page one. Rory has a beautiful style of writing that brought the world of Raxter and The Tox alive before my eyes. The idea is unique and terrifying. When the cause of The Tox is finally revealed in the last few pages it is horribly terrifying because it seems so real and like something that could actually happen. As grisly as some scenes were I loved seeing what The Tox did to the girls, Mr. Harker and the animals and vegetation that called Raxter Island their home. From girls having multiple hearts, growth of an additional spine, silver scales spread across their hands the affects were terrifying and had me flipping the pages to know how this mysterious virus worked. As I mentioned above Rory's writing is beautiful and I have established that I will probably read her grocery list if she decided to publish that. We are interviewing Rory on the blog on May 5th and having read the answers to some of her questions gave me a greater appreciation of Wilder Girls and where is takes place. The ending killed me because my imagination is running rampant with the million different ways things could happen. I have so many questions and there is a part of me that is hoping for another book, but I also like the open ended aspect because I get to decide for myself how these girls story ends. 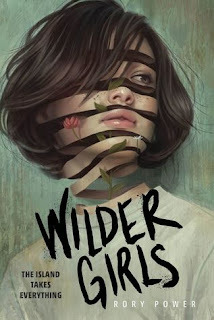 Overall, I loved Wilder Girls and I can't waiting for this beautiful, strange and horrifying (in a good way!) novel to be out in the world for everyone to read and love just as much as I did. Check back closer to release date for my full review and on May 5th for an exclusive interview with Rory! This is a very cool concept and I like the sound of this one. Great review!